Since April 2014, Belk at the Galleria Dallas has been such an awesome addition to our city for so many reasons. But, Modern Southern Style isn't all they're about. Belk donates $21 million to charity each year. I had the chance to chat with Belk's Jessica Graham, VP of corporate communication and community relations, to find out more. The company is particularly dedicated to raising funds and awareness for education, breast cancer and community strength. Though Belk mainly focuses on these areas, they also allow community members to get involved in raising money for the causes that are most important to them. This past weekend, Belk held its semiannual Charity Day Sale where local Belk shoppers could sell $5 coupons and volunteer in the store to raise money for their favorite charities. I think this is one of the coolest ideas for a fundraiser, and all of the money goes directly to the charities. Belk is simply the facilitator and doesn't profit from this event. More than 8,000 charities participate each year and the promotion yields about $10 million for worthy causes. 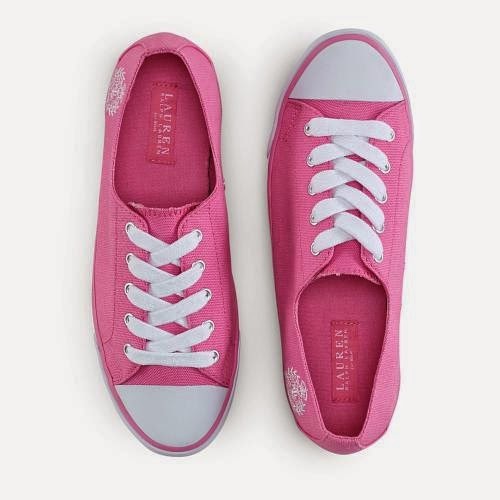 This year, Ralph Lauren designed a pink tennis shoe (also comes in black or white) that is exclusive to Belk and a portion of the sales will support breast cancer awareness and mammograms. As the only department store that offers mobile mammograms, Belk has become known for its Mobile Mammography Center that visits Belk stores to offer checkups. Notice the cute RL shoe that's wrapped on the bus! 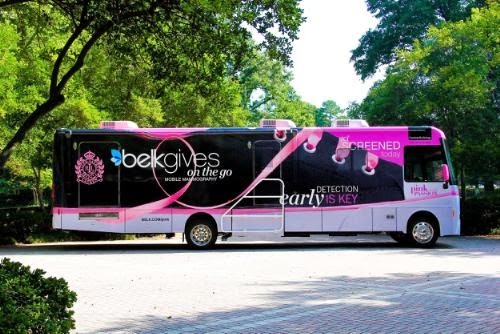 There are currently 300 Belk stores in 16 states and the mammography bus will visit Dallas next year. After hearing about all of the extraordinary things Belk does for the community, Jessica went on to tell me about their program with Discovery Education that teaches middle school students about the importance of giving back. Participants design a project to help solve an issue in their communities for a chance to win scholarships. In Dallas specifically, Belk also partners with the United Way, Pat & Emmitt Smith Charities, and Junior League. To learn more about Belk's charity efforts, check out their website.